WHK Cleaning Services are a Dartmouth-based business who offer domestic and commercial cleaning and holiday home management services. They were established in 2006, by a team who were reacting to the growing demand in the South Hams for reliable cleaners and caretakers. We were approached by WHK and were initially asked re-design their existing brand identity. 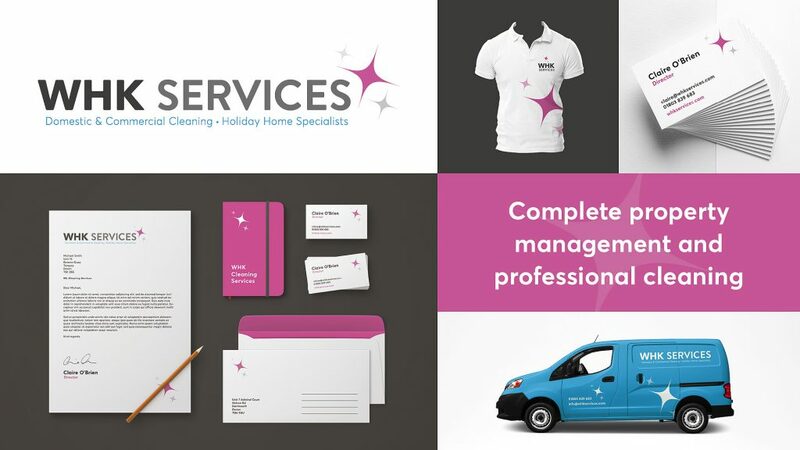 The branding project expanded to include designs for newsletters, company uniforms and graphics for a van wrap. We also provided Social Media Optimisation services improving their Facebook account and providing customisable branded templates. In preparation for this branding project we researched WHK’s local competitors, spent time finding out what services a typical client comes to them for, and finally delved deeper into WHK to understand the values of their business and the people who operate it on a day to day basis. WHK Services, which is short for Wrighthouse-Keeping Services (the family name behind the business), had not updated their brand since launching in 2006 and required a refresh to bring it up to modern standards.